A good journalistic idea, according to Henri Nannen, founder of the illustrated magazine Stern, should be one you can call into the kitchen. "Have you heard? The government wants to raise taxes again." That, for example, was a kitchen call à la Nannen. Journalists who worked at Stern, as Nannen saw it, should prepare texts that in the best case served as templates for kitchen calls week after week. All that was some time ago. 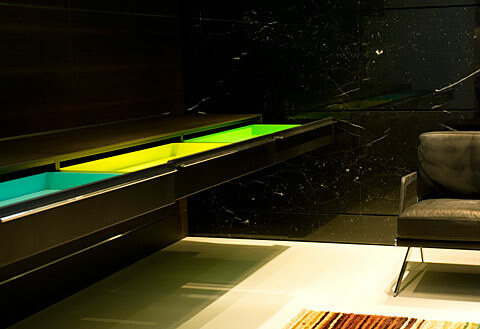 "Shifting Contexts" was the motto of an evening at the Bulthaup showroom in via Durini in Milan. How about, observers wondered, instead of attending another 399 events that evening, just staying put? Waiting to see what happens as the evening wears on? An absurd idea. And yet, it was warm enough to chat with the smokers outside. On the agenda are an extraordinary kitchen, the company patriarch Gerd Bulthaup, who once decidedly pointed his firm in the right direction, and his nephew Marc O. Eckert, who has been guiding the family-run company's fortunes since 2009. Also appearing: Mike Meiré, who works for international brands as a designer, art director and curator. We need think only of his redesign of the "Neue Zürcher Zeitung" newspaper and the magazine "Arch+". He has encouraged many of his clients to engage in cultural projects, to cross boundaries and find new themes, which may then possibly engender new products or services, but not always. 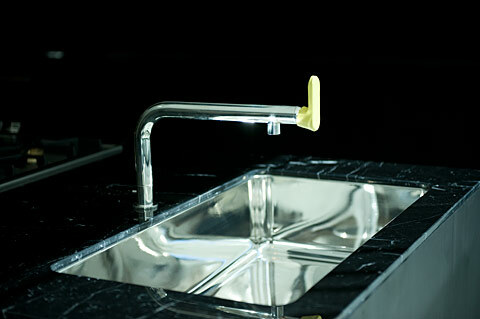 His collaboration with fixtures manufacturer Dornbracht, for instance, is especially intensive and lasting. 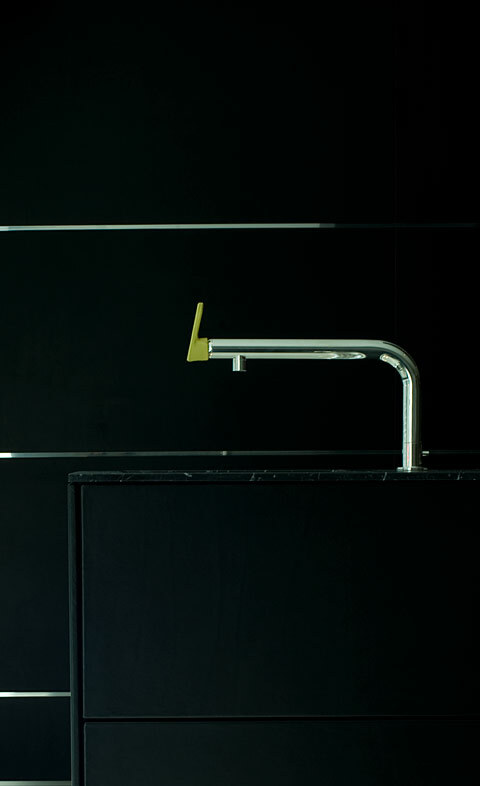 In 2006, in the context of the series Dornbracht Edges, Meiré presented (also in Milan) "Farm Project", which on the one hand could be interpreted as a counterpoint to high-tech and purist design, but on the other, owing to the presence of live animals, made it inescapably clear that food does not come from the deep freeze, just as electricity does not come from the plug socket. "Farm Project", says Mike Meiré, "was something like my anti-Bulthaup kitchen". He pays precious little attention to fixed roles. Is he an artist, designer, director, or curator? Anyone looking to pin Meiré down in a particular job will see him slip through their fingers. Yet now it is all about shifting contexts, causing confusion. 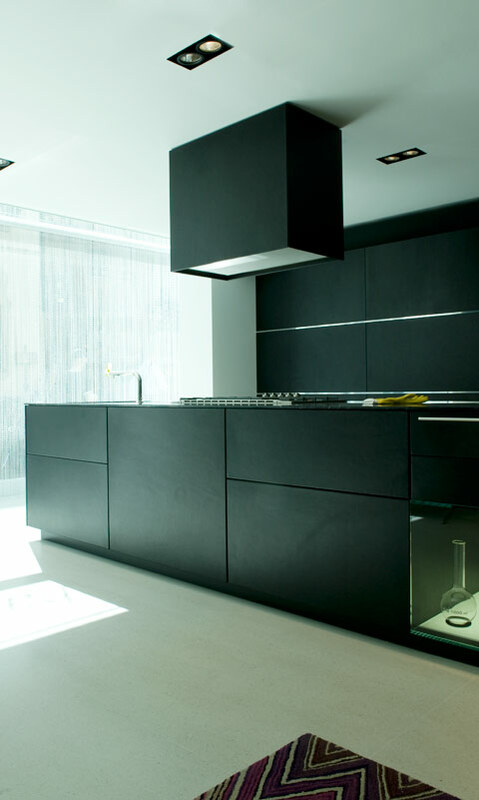 Mike Meiré did not design the kitchen system "Bulthaup b3". It too was presented in Milan years ago. Herbert Schultes designed it, who was also present at the event and refused to comment on what he thinks of the revamp of his design. Although he was wearing his perennial friendly and impish grin, he seemed to be suffering a little. And that is understandable. For with his reinterpretation, Mike Meiré assaults the holiest of holies of the German design scene. Although he is from Aich in Lower Bavaria, a Catholic region, Bulthaup advocates sublimation and purism, the combining of technology and workmanship for the use of cooking enthusiasts of any age. Not least, the brand embodies the values of West German post-War culture. Moreover, it stands for successful collaboration between businessman and designer. For once, many years ago, Otl Aicher (essentially, like Mike Meiré, a communication designer and not a product designer) convinced Gerd Bulthaup that before starting to design kitchen furniture, you need to know the foundations of kitchen culture. A journey together through the kitchens of professional chefs led to Aicher's book "The Kitchen is for Cooking". Instead of promptly designing a new CI for the company, which was the original plan, Aicher advised Bulthaup on long-term strategic issues, as is en vogue today. Aicher presented his experiences as a passionate cook and his expectations of a kitchen as an island-like workshop, where cooks work around it. And he propagated a departure from conventional kitchen units, built along a wall and sandwiched into a box room. His book, first published in 1982, is worth reading to this day. "Today's kitchens, with their clarity of design, exude an aesthetic quality of passivity and prestige," noted Aicher at the time. "They are attractive, but lack action." We could almost say the same of the present. For kitchens for cooking in are essentially on their way out. More in fashion, especially among high-end producers, are show kitchens, kitchens that naturally are able to function perfectly in terms of technology, materiality and workmanship, if, indeed, one wishes to use them. In this respect, Meiré has really hit the mark with his completely over-the-top design, the black kitchen covered in leather. For it reminds the company – as if that were necessary – what people actually want today. 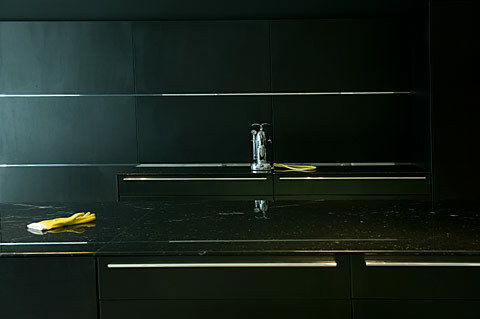 At the same time, his black leather-clad kitchen fetish is also a tongue-in-cheek statement. He borrows the materials and colors for his interpretation of the modular kitchen from the living area, with which, as we well know, the kitchen is increasingly merging. 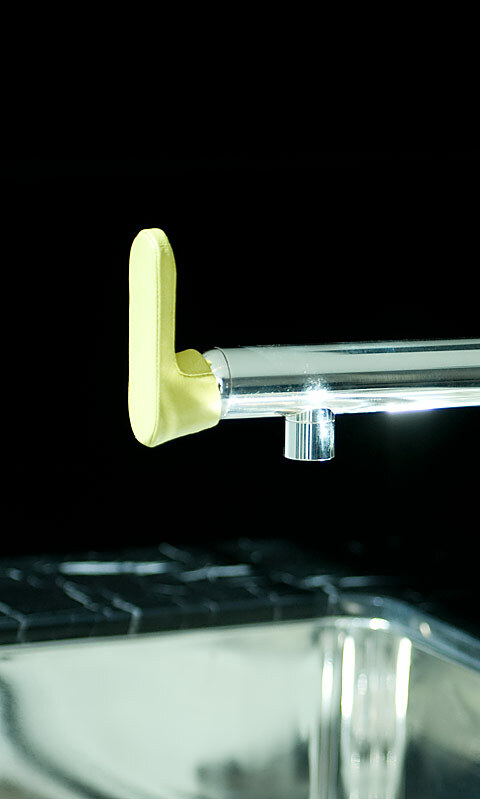 The fixtures and handles are silver-plated. All in all a nightmare for Aicher and his idea of the open kitchen, which was also conceived as a model social space for resolving conflicts and for communication during and through work. 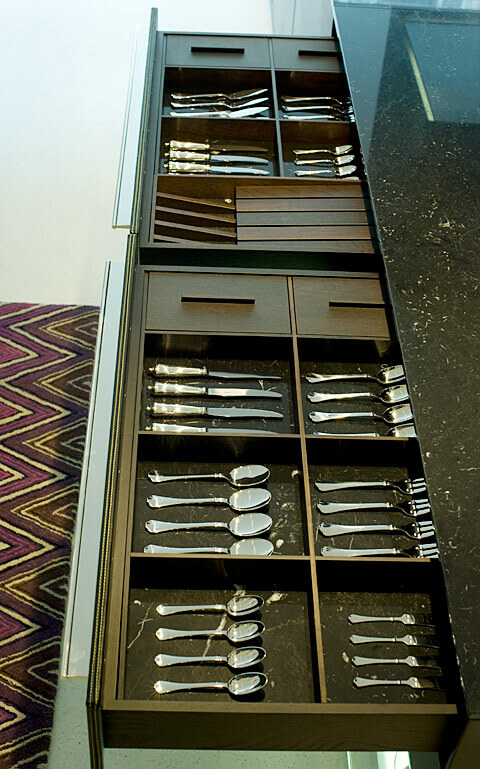 Of course, drawers with bases made of the same material as the worktop are outstanding. 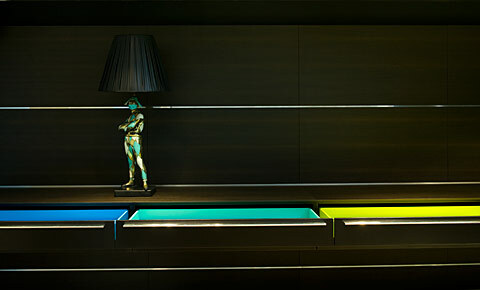 Naturally, sideboard drawers resplendent inside in light blue, turquoise, light green and sulfur yellow are breathtaking as soon as you open them. But is that really important? And still, soon several buyers will want to have and order precisely that. A large number of designers turned up on premiere evening in Milan. Stefan Diez was there and Nitzan Cohen, who co-organized a fabulous party the following evening with Mattiazzi chairs. The chairs, which also unite modern technology and traditional craftwork, were scattered around, and video clips were running selected by the designers of the chairs. 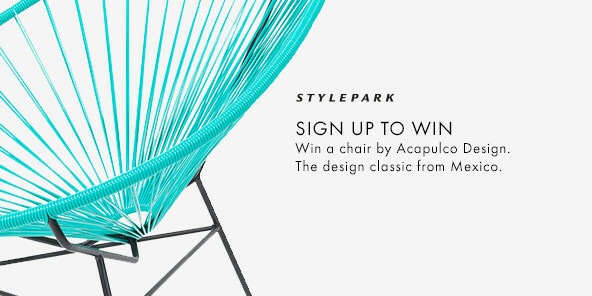 Well, with the exception of Konstantin Grcic, the designers' assistants chose the music. For that is part of their job too: arranging things that journalists can later call into the kitchen or wherever else. But now back to via Durini: Some grumbled under their breath, others were horrified. 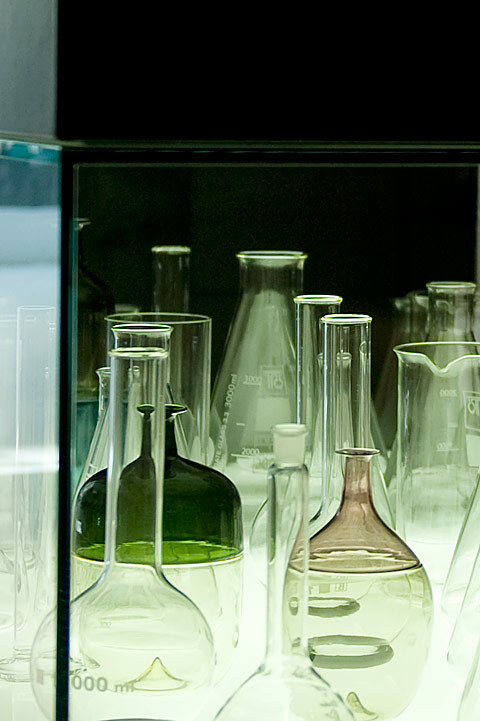 Especially at the silver-plated fixtures, whose operating elements are covered in luminous sulfur-yellow leather. Someone stated that it is applied art. Another said the design lacks inspiration. And the following day the Munich-based designer Fritz Frenkler would ask the rhetorical question: "Must there always be drama up there?" Subsequently, speeches were held inside. First a brief address by Gerd Bulthaup, who called to mind the immovable pillars of tradition of his company. There is the brand, now under the artistic direction of Mike Meiré. There is also the family management, now in the third generation. "We consider our product", said Bulthaup, "classic and above all timeless." A further important pillar is distribution, which is selective, and an export share of over 80%. 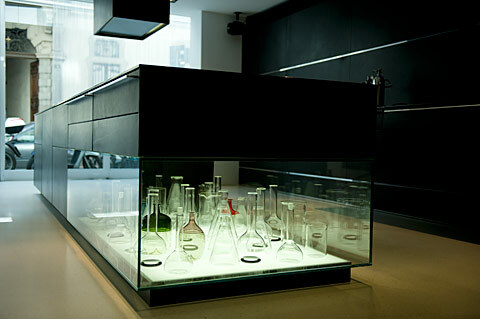 He ended by saying that Bulthaup's origins shape its future. Then Marc O. Eckert took the stage, speaking less briefly, but in English. The knowledge-based society of the 21st century has brought forth the informed customer, explained the managing director. And offered a motto that could just as well come from a moody teenager or the non-conformists of days past, but which may serve as a perfect description of the situation of high-end producers like Bulthaup: "We are not living in the age of either-or, but the age of both." In other words: Bulthaup will of course continue its established traditions, which, as Eckert says, are shaped by the Bauhaus and "form follows function". Yet at the same time, he notes, there is a need to respond more strongly to the expectations of an international and wealthy public. Values such as refinement by way of reduction, which once contributed to the international success of the brand, may well take a backseat with a new public. A group of buyers is emerging which does not know what to do with the critic Wolfram Siebeck's statement, given in an interview, that, "I have realized that there are a great many things we don't need, especially decorative objects." "Shifting Contexts" will be continued as a series. Bulthaup is looking for new protagonists, as Eckert said, "creative minds from Asia, the USA and Europe", architects, artists and designers who are to "see a Bulthaup kitchen through their own eyes." The three presentation areas at the showroom in via Durini were linked by a glass-clad spiral staircase. Behind it, in the salon, which featured smoked oak wall paneling with partly silver-plated shadow gaps, the American Pop musician Joan Wasser, known as Joan as Police Woman, sang, played, and called. Her smart, melancholy, effusive songs floated through the room. "You have to party all week?" she asked the audience with gusto. Whatever its design, the kitchen is still a wonderful place for all kinds of kitchen calls. Surfaces are covered with leather.